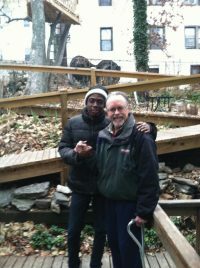 An ex-communitarian tending full-time to an aging parent reflects on how intentional communities can help shift our approach to elder care. As intentional communities model new approaches to elder care, baby boomers can lead the way in transforming how we age in our society. Finding themselves to be elders in a multi-generational community, two baby boomers resist, accept, then finally embrace the idea that age DOES matter. Our new format features 100 percent post-consumer recycled paper, as well as color throughout the issue—better reflecting both our ecological values and the richness of life in cooperative culture. 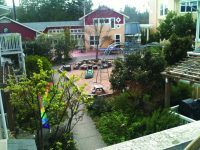 What role can baby boomers (born 1946-1964) play in a new resurgence of intentional community living? Where can they find and offer support to meet their and others’ needs over their final decades of life? 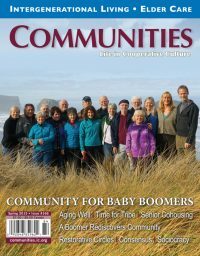 How can aging baby boomers regain the sense of community that defined much of their generation as youth and young adults? What gifts do baby boomers offer to younger generations? In “Community for Baby Boomers,” our contributors explore these questions and many more.